assemblies with a maximum power of 500 Watts. 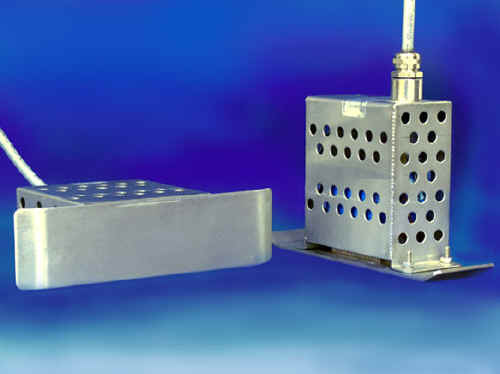 Our magnetostrictive transducer is silver-brazed to the Shoe's sliding surface creating a solid-state assembly. This assembly may be vibrated, experience high velocity impacts, tolerate wet operation, and operate for years without deterioration in acoustic performance. Our solid-state silver-brazed transducer is built without threaded fasteners providing years of reliable service. The Sonic Shoe, M/N: SS-902-SLM. 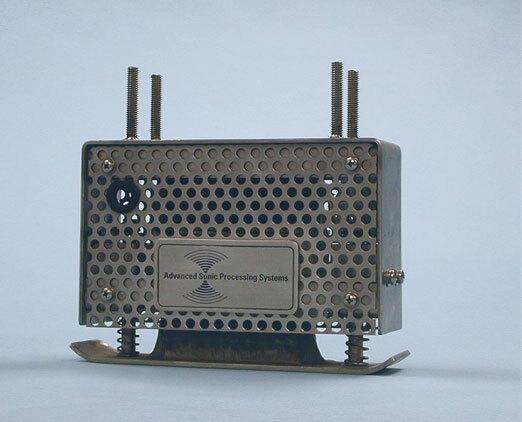 This Sonic Shoe, SS-902-SLM, is equipped with a Spring Loaded Diaphragm Plate Mounting. The Spring Loaded Diaphragm Plate provides constant pressure to the Transducer Assembly for maximizing contact with the material requiring ultrasonic treatment.